Built in 2010, by the Foss Maritime Maritime Company of Rainier, Oregon (hull #13) as the Lucy Foss for the Foss Maritime Company of Seattle, Washington. 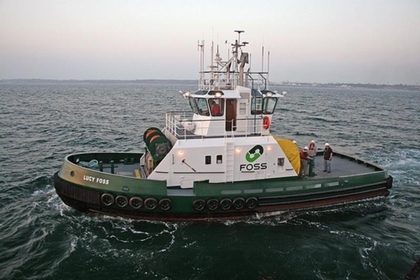 The tug was built as a utility, mooring, and assist vessel to support operations at the Chevron Oil Company's El Segundo Moorings in Southern California. Equipped with hydraulic spill boom reel, and segregated line storage winches. Powered by two, series 60, Detroit Diesel MTU diesel engines. With ZF W350-1 reduction gears. Turning two, four blade, 50(in), fixed pitch propellers. She is a twin screw tug, rated at 1,200 horsepower. And is also fitted with a 60 horsepower, Westmar, electric, bow thruster. Her electrical service is provided by one, 50kW Marathon generator set. Driven by a John Deere 4045 diesel engine. And, a 115kW generator set. Driven by a John Deere 6081 diesel engine. The tug's capacities are 5,500 gallons of fuel, 300 gallons of lube oil, and 630 gallons of water. The deck equipment consists of 1,000(ft) of self inflating, Kepner oil containment boom. Stored on a reel on the vessel's stern. And two, line reels, mounted on her bow. Hailing Port: LOS ANGELES, CA.